The Edo period was witness to what was simultaneously one of the most prosperous and one of the most totalitarian regimes in Japan. In the years between 1600 and 1868, the region saw unprecedented economic growth, extremely rigid social orders, and foreign policies that were almost xenophobic in their utter distrust of possible external allies. To conceive a proper picture of Japanese feudal society at that time, one has to conjure images of genuflecting farmers, unrelenting Shoguns with their elaborate palatial etiquette and their insistence on the upholding of certain impossibly inflexible norms of behaviour. It was a time when one could get executed if an official misconstrued that disrespect was intended from something as trivial as a tilt of the head. What is more interesting is that people took it upon themselves to nourish this system of rules, and strived to live the fullest of lives in accordance with the doctrines of the Shogunate, and those of their regional heads - the Daimyos. It was a time when men set great store by honour, as is evident from the legend of the 47 Ronin (which shall be shortly presented). The title of "Ronin" was one that brought deep shame to a Samurai. It implied that the warrior had failed his master in some way and was, therefore, banished from the latter's service. In the time of the Edo empire, under the Tokugawa Shogunate, unemployed Samurais who sold their warring expertise in exchange of a livelihood were considered to be a disgrace to the society. This was in direct contrast to the preceding era, when Samurais were almost the same as mercenaries, something that Akira Kurosawa shows in his period movie "The Seven Samurai". The story of the 47 Ronin goes thusly. In the Ako domain of Japan, the Daimyo (regional chief under the Shogun), Lord Asano (played by Min Tanaka in the movie), is expecting a visit from the Emperor - the Shogun - himself. Meanwhile, Kira (Tadanobu Asano) - who is shown as a rival chief in the movie, but who originally was a teacher at the Imperial Palace and was assigned to teach palace etiquette to Asano - is plotting the former's death. In the movie, Kira uses the help of a witch Mizuki (Riko Kukuchi) to ensure that Asano is falsely implicated in a situation which leads the Shogun to sentence him to death by Sepukku (mortal disembowelment by one's own hands - a glorified form of suicide). This incident leaves Asano's Samurais masterless and they are Ronins now. Even though the Shogun forbids them to seek revenge for their master's death - something that the Samurai code of honour, the Bushido¬ - mandates, the 47 Ronins gather under their head, Oishi (Hiroyuki Sanada) in order to take on Kira's 1,000 men and avenge their fallen master. 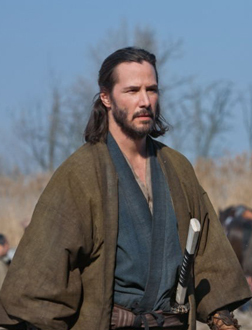 Into this enduring tale of loyalty and honor, people saw it fit to introduce a bumbling wooden Keanu Reeves as Kai, a half-Japanese and half-British boy who is rumoured to have demonic powers and who turned up in Ako when he was a boy. The Daimyo apparently took him in, and Asano's daughter Mika (Kou Shibasaki) becomes emotionally attached to the boy as they both grow up - an exceptional feat considering that Reeves deadpan expression generates exactly zilch amount of warmth. Seriously, witches? Lovecraftian-reptilian-Buddhist-monks? Even more so, a non-Samurai hogging limelight in a tale that was supposed to be about the sword wielding warriors of yore? The film suffers mostly because the makers have to keep finding excuses to bring Kai into focus, when this is NOT EVEN HIS FILM. The set pieces and the costumes have been done well and the colour palette is especially note-worthy. But apart from that, the film does not arrest attention at all. After a while, it feels like you are just staring at a really pretty painting. What else can you say about Keanu's immobile facial muscles? The film moves at a morbidly sluggish pace, and all that CGI grandeur is wasted when you see the actors struggling within their one-dimensional roles. Only Riko Kukuchi stands out as the vulgar and deliciously devilish witch who wants Kira to take over the whole of Japan. And to think that her character was not even in the original story. The movie is a waste of anyone's time and willingness to learn the story of 47 incredibly brave men. We recommend you watch "The Loyal 47 Ronin" by Kenjo Mizoguchi. At least that doesn't have Keanu Reeves. 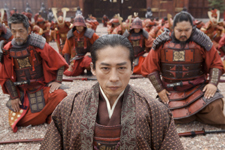 Be the first to comment on 47 Ronin (Hindi)! Just use the simple form below. fullhyd.com has 700,000+ monthly visits. Tell Hyderabad what you feel about 47 Ronin (Hindi)!